Joey D here, writing from Palm Beach Gardens this week. Great to be working the Tour this week while also having the benefit of working from home. We're getting ready for the Honda Classic this week and we're looking forward to some good, warm weather. No more of the cold, wind and rain we experienced out on the west coast this past month. I know the players are looking forward to the consistency that comes with the warmer weather. The kickoff of the Florida swing is big as you have a lot of guys trying to sharpen their skills with Doral next week and the Masters a few weeks out. The first major of the year is right around the corner, so guys are going to get really serious over these next few tournaments. From a biomechanics standpoint, we really have to get guys dialed in over the next month. We'll talk to their swing coaches and we'll really hone in on what they're trying to accomplish as far as where they need to be in their body position. 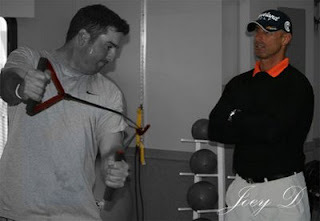 For those who don't know, biomechanics coaches work very close with swing coaches. A swing coach will tell us they want a guy's arms in this position, the club in this position, this is where we want them to be at impact, spine angle, hips... all that. I'm working with two different types of players right now -- the guys who are in the Masters and are fine tuning, as well as the guys that are right on the bubble and need to make some moves up the rankings to ensure a spot in the first major. Those are two completely different situations and need to be managed accordingly. We really have some great golf ahead of us these next few weeks. The Florida swing is always great because of the weather, the diversity and the types of fields that we have. You'll see a lot more guys in the upcoming events. The World Golf Championship in Miami and Mr. Palmer's event at Bay Hill, which always brings out some of the best players in the game and makes for an exciting time for the players, us coaches and you spectators. Back to the Honda, this is a good tune-up week for me and opportunity to get reacclimated to the east coast. I don't have a full field regarding my guys. Pat Perez is taking off his first week of the year after playing seven straight, getting his first win and ousting Padraig Harrington in the opening round of match play last week. Jason Gore isn't in the field as it's tough for west coast guys to get a sponsor's invite for an east coast event. Jason Dufner got in as a Monday qualifier, so he's now in the field. Charlie Wi and Tom Pernice Jr. are the other guys I have going this week. Both are talented guys, both are playing good golf right now and both in need of a few good weeks so they can earn a spot in the Masters. Since I have a light week this week, I'll really be able to focus on those guys and give them the extra time they need. For the casual observer, next week will be an interesting week with Tiger Woods back in the mix after losing in the second round of match play. Since then you can be he's sharpening his skills. That was just a warm up and you have to think his number one focus right now is Augusta. Still, the excitement and energy is back with him playing again. His absence was good for golf, as it had us focusing on and noticing other players, but it's obviously better with him. Tune in to this week's Honda Classic and I'll be back in a few days with more to report.